This is romantic Spain…the one the tourists flock to. Yet you’ll find plenty of genuine local retreats and unexplored corners, age-old villages where women still wash clothes at the local fountain, or the occasional burro pulls a cart. That’s not to say the place is backward. Spain enjoys internet speeds that are among the fastest in the world. Spain’s airports are sleek and modern, fast highways and high-speed trains link Andalucía to the rest of the country, and everyone, it seems, has a cell phone. To gild the lily, it’s affordable. A couple can live well in many towns here on $2,000 a month, including rent…eat out for less than $30 (and you’ll want to—the food is amazing)…and travel the country by rail or bus at discount rates. Though Spain’s real estate slump is officially over, bargains are still around. Throw in Andalucía’s amazing Mediterranean weather, where on the coast even winter days average temperatures in the 60s F…and the varied terrain, where snow-capped peaks for hiking and skiing lie mere hours from the beach…and it adds up to arguably the best value for money in Europe right now. Andalucía is big—nearly 34,000 square miles—with plenty of variety. From chic Marbella to cozy beach towns, from exotic Moorish strongholds like Granada and Córdoba to romantic sherry towns and more, this part of Spain offers something for everyone. So where should you start? Well…here’s a guide to some of the most appealing spots, all of them easily accessible by air and highway. Just walking down Calle Larios can lift the spirits. This pedestrian-only street at the heart of Málaga’s historic center is lined with shops and cafés that draw the eye. Overhead, several stories up, canopies strung across the street shade you from the bright Mediterranean sun. There’s been a port here since about 1,000 BC (Málaga is one of the world’s oldest cities), and it’s still one of Spain’s busiest. But no signs of creaky old age here: A sleek boardwalk—or paseo marítimo—runs for miles along the shoreline. Green park spaces with benches, kiddie playgrounds, and plenty of shops and restaurants make this area a hopping location. Málaga proper has just under 600,000 inhabitants, and a metropolitan area of about one million. So it has all the goodies you’d expect from a metropolis—good hospitals and public transportation, a major international airport, great restaurants, as well as those shops and museums. Yet it’s laidback and remarkably affordable. Even in the historic center, within walking distance of shops and the sea, you can get casual lunches starting at about $10 and proper sit-down meals for $15 to $20. Apartments for sale start at under $200,000. Go just a couple of miles from the historic center (and still along the paseo maritimo), and you reach pleasant middle-class neighborhoods where small one- and two-bedroom apartments start at $130,000 or less. Long-term rents in these areas start at about $655 a month. Farther west are chic Puerto Banús and Marbella, which have long attracted the jet-set crowd. They’re past the suburban train line, but there is frequent bus service. 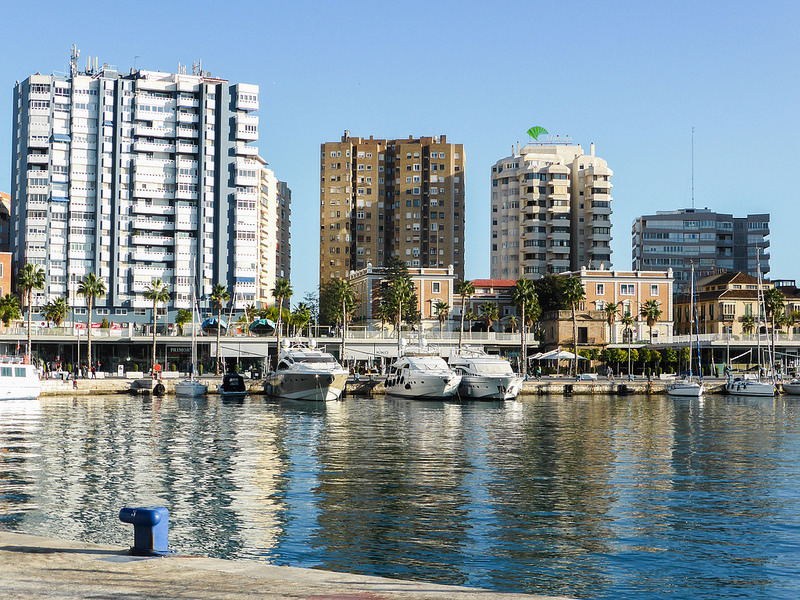 Luxurious Puerto Banús has a huge marina, surrounded by shopping malls, restaurants, and more. Between Puerto Banús and Marbella stretches The Golden Mile (actually, four miles), lined with luxury residences. Marbella offers museums, performances spaces, and a historic center, as well as newer neighborhoods. You’ll find properties at all price ranges here, depending on how far you want to be from the water. East of Málaga is a string of quaint villages all the way to Nerja, about an hour from Málaga by car. Nerja is one of the prettiest towns on this coast, and its style is typical of what you’ll find here. White-washed Andalusian cottages with red-tile roofs line the narrow streets. Many have been converted to small hotels or vacation rentals, while others are shops selling beachwear or snacks. Along the seafront are restaurants with back patios looking out to sea. The Mediterranean here is deep blue and right on your doorstep, and the sandy beaches are white. I spent a day in Nerja with friends, soaking up the sun and the ambience. Leafy trees on the restaurant patio shaded us as we enjoyed frito mixto—a classic Andalusian dish of small, fried fish and seafood—while looking out at the Med. Frankly, for ambience, it doesn’t get much better. And even in an upscale restaurant, in prime tourist season, our filling multi-tapa meal, complete with drinks and tip, cost us only about $20 per person. In summertime, villages like Nerja are busy with tourists. Life is quieter in winter (though rentals may be easier to find). If you need more constant activity and nightlife for winter stays, consider beach towns closer to Málaga, such as Torremolinos, with its large, full-time population, or resorts like Marbella and Puerto Banús. An hour’s drive inland from Málaga takes you to Granada (there are buses almost hourly). With the towering Alhambra and the winding streets of its medieval quarter, the Albayzín, Granada seems ripped from the pages of the Arabian Nights. And in some ways it is. This was the Moors’ last stronghold in Spain, surrendered in 1492 with many tears. It still breathes exotic romance. Thirty years ago, when I first visited the Alhambra as a wet-behind-the-ears student, I could waltz right in and have it to myself. Those days are long gone. Today Granada is a major tourist destination. Book in advance if you want to see the Alhambra (and you do), especially if you go in summer. The city is also a firm fixture on the backpacker circuit, one of today’s must-sees for teens and 20-somethings. The down side to that is plenty of tourists pretty much all year. But the upside is a city with a youthful ambience, a lively bar scene, and plenty of good eats and lodgings at low prices. 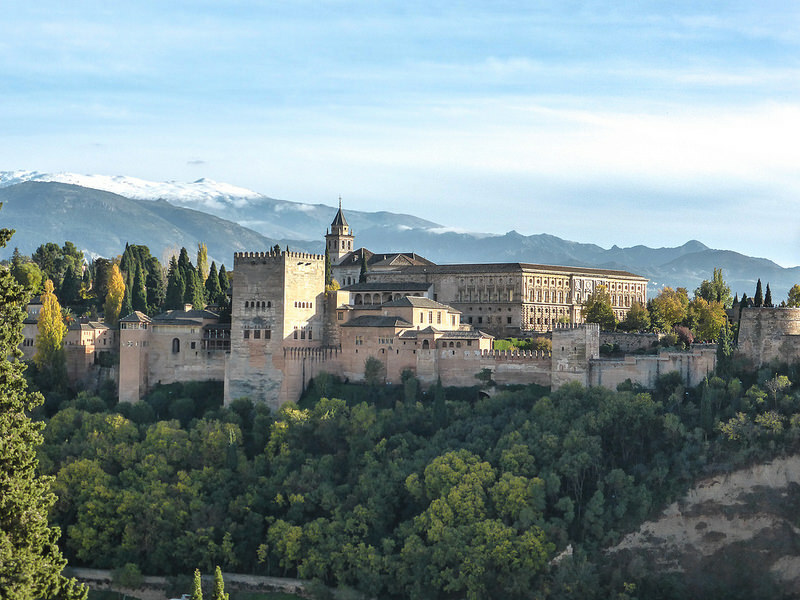 My advice: Visit the Alhambra and the quaint Albayzín by day…then head downhill to Granada’s newer old town after dark to hit the lively bars for the wine, the music, and the tapas. All this central, historic part of Granada feels small and cozy. The steep streets up to the Albayzín are like walking along an Arab bazaar: Harem pants, tunics, and embroidered cushion-covers spill from shop entryways, and every other restaurant features hummus and baba ghanoush. Walk down to the newer old town, and two- and three-story buildings feature storefront shops and terrace restaurants and bars. But this is actually a city of 239,000 people. Outside this center are plenty of shopping boulevards in grand, 19th-century style, and upscale, residential neighborhoods with comfortable houses. 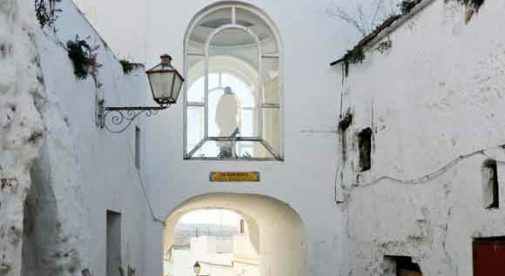 Up in the Albayzín, renovated apartments for sale start at about $120,000. Renovated houses or villas can start as low as the mid-$200,000s. Apartment rental rates start at about $450 a month. If you prefer the modern part of town, a typical example is a three-bedroom, one-bathroom in central Granada, near shopping. The apartment, recently on offer, was listed for $169,000. For full-time living, Granada may feel small. But it’s easy to get away by car or bus—and there’s plenty to see in the area. It’s generally agreed that Andalucía’s three must-see destinations are Seville, Córdoba, and Granada. And it’s hard to argue with that logic. Each has a charm that is peculiarly its own—and all three are quintessentially Andalusian. Seville is known for its beautiful architecture, its stately Holy Week processions, and the liveliness of its tapas bars at night. The city has also inspired music, from the sevillanas heard throughout Spain to operas like Carmen (whose Tobacco Factory is still here). This is a city that loves to have a good time, and most visitors do. Córdoba, like Granada, is known especially for its Moorish heritage. Its cathedral, its Great Mosque, and its Roman bridge are just a few of the sights in the historic center: the largest UNESCO protected urban center in the world. The center still has some of its Roman walls, and dozens of churches, monuments, and garden spaces. Horse lovers will want to take a squint at the royal stables, where Andalucía’s famous horses were bred. Though lacking Seville’s flash and verve, Córdoba offers rich history and plenty to see. As for Granada…see above. With winter here, I'm starting to daydream again about living in Valencia. It's one of my favorite cities in Spain... There's a lot to like about Valencia. First, there's the location and climate. It sits right on Spain's eastern Mediterranean shore. You might think that spending winters on the Mediterranean sounds like a dream. That’s what “they” want you to believe. But the truth is, winters on the Med are the stuff nightmares are made from. Don’t believe me?